Once again it shows that my mailman has excellent timing, I wasn't sure what to do with my nails today and then I got a package! 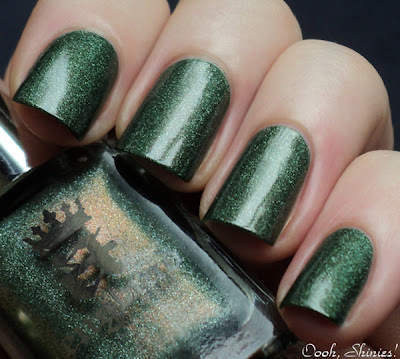 I received 3 polishes from the new "The Legend" collection from A England, and today I have the first 2 for you. Unfortunately there was no sun today, so my camera had a hard time capturing the subtle holo in these polishes. But I couldn't wait any longer to try these beauties, can you blame me? :) Of course you'll see them again sometime when there's sunshine! 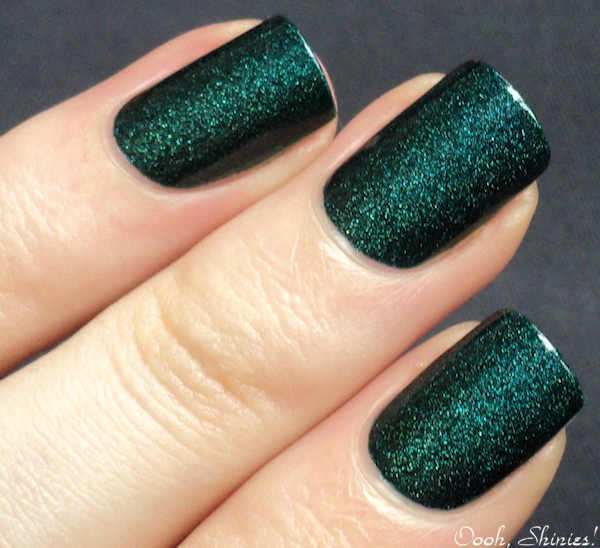 The 3rd polish (Princess Tears) really deserves some sunshine pics straight away, because the holo in it is much stronger. Dragon is a mossy green that flashes coppery-golden (as the bottle shows well), and it has a subtle scattered holographic effect. It reminds me more of a forest than of a dragon though, but that's probably because I play WoW and the dragons there have different colors, lol. Anyway, this pretty is unlike any other green I've ever seen! I used 2 thin coats here, but 1 thicker was probably enough as well. 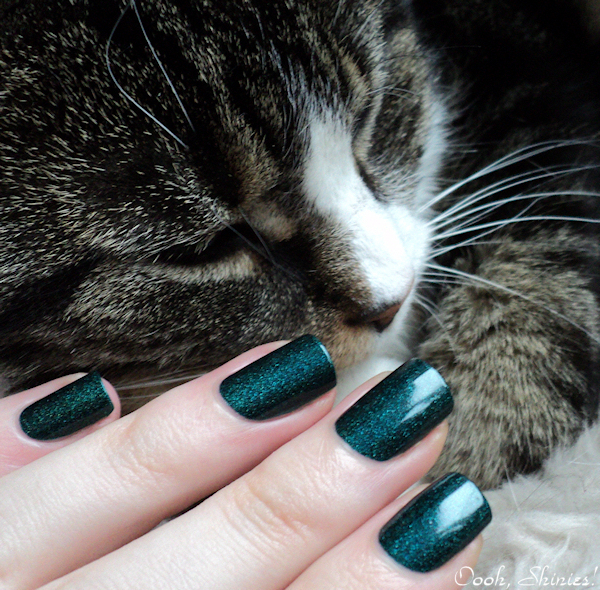 Tbh, this one should've been called Saint Polish or something, whát an awesome color! Tristam is one of my favorite polishes when I'm in a rush or not sure what to wear, but it got some serious competition now from Georgie here. It's a gorgeous teal that leans more green or blue depending on the light. Also has the scattered holographic effect that gives it that deep, rich color. And because Adina (the lady behind A England) loves cats as well, I wanted to use my cats as background for some pics. They weren't in the mood for that (luckily you can't see the look in Sue's eyes here, hehe), but here you can see how blue Saint George can look as well. Both of these just glide on your nails like butter, and dry fast and shiny. Adina really made a fabulous collection that was well worth the wait! The Legend polishes will soon be added to the A England website, and in the meantime you can order them by sending Adina an email.